Winter is prime time for selling and buying a home, though many folks tend to think otherwise. At the beginning of each year, we see a surge in activity with buyers getting their credit in check and looking at homes online. They spend Christmas break looking at homes and showing off their finds to friend and family, so capitalize on their excitement when they come to view your home! Showings in winter may take a little extra thought to see your home from an outsider’s perspective, so here are a few tips to to make the most of your time with potential buyers. Though South Carolina doesn’t see a ton of snow, make sure buyers have a clear, ice-free path to the front door. 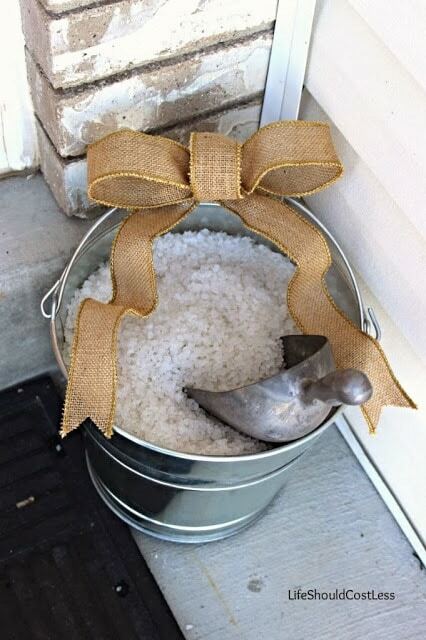 Keeping a bucket with salt/ice-melt in it is a handy (and adorable) way to remind yourself to sprinkle a path on showing days when inclement weather is in the forecast. Icy and rainy conditions usually mean buyers will be walking through the door with wet shoes and heavier coats. As much as they try to be polite and respect your home, potential buyers track in all sorts of things — all over your freshly cleaned house. Create a landing zone by the entrance to keep messes to a minimum. Even if you don’t use the front door often, having a central place for all the extra layers winter requires will help you stay organized. Provide baskets or cubbies for messy shoes, a coat tree or hooks for coats and scarves, an umbrella stand and a cute note asking visitors to remove shoes and as many layers as they need to move around. If you want to be super nice, grab a few pair of dollar store slippers so potential buyers don’t have to traipse around in their socks. Piles of snow cover your yard, icicles dangle from your trees, and you can’t step outside without six layers of clothing. Winter isn’t coming—it’s here. But a serious chill doesn’t mean you need to turn your home’s interior into a sauna. Find a reasonable temperature for your thermostat, Moshé says—and that does not mean 80 degrees Fahrenheit. “Your potential visitors will be entering your house from a much colder outdoor temperature,” says Justin M. Riordan of Spade and Archer Design Agency, a home staging company in Portland, OR. Buried in hats, coats, and boots, they will find the 80-degree temperature downright steamy. Stick to 68 degrees to keep everyone comfy. “If they find the temperature inside the house to be uncomfortable, that may sink any chance of making a sale,” Moshé says. While you want your home to remain as neutral as possible so potential buyers can envision themselves living there, nobody likes a scrooge! Buyers don’t expect you to remove any holiday decor, but at the same time — don’t go overboard. Don’t cover every inch of the home with glitter, garland and blinking lights, but feel free to leave your tree up (without stacks of presents) around Christmas or some winter greenery on the mantle and front door to keep the holiday cheer going in the new year. A festive throw on the couch is a lot better than an inflatable snow village in the front yard. The goal is to keep buyers thinking about the home — not your decor choices and traditions, which may vary greatly from theirs. Winter isn’t exactly known for its sunny days, which can be tough to workaround when trying to see the details of a potential home. A bright and cheery home will always feel more welcoming than one covered in the drab of winter’s overcast days. Sure, you’ve survived with your lights as is for long enough, but are they enough to entice your buyer? Give each room a long, hard look. If it lacks can lighting or any kind of built-in light fixture, double up on lamps to make the room pop. Adding more bulbs isn’t the only way to brighten a room. Merrill recommends removing drapes, scrubbing the windows, increasing your wattage, and trimming outside bushes to let the sun shine in — whatever sunshine there may be!